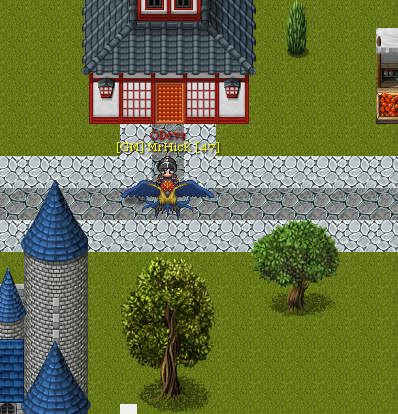 Hey everyone, so I have been actively developing a 2D Top-Down MMORPG called OutCast Online for a few months now in partnership with a gaming community called Cyberstorm Gaming. It is currently in its pre-alpha testing phase and is free to play and open to the public for download as of Friday (10/27/2017). It was meant for an early release on Halloween as the theme is slightly spooky. Taking place on the continent of Zenna, an evil nation is dominating the continent by the name of “Barusem”. You wake up in a dark forest with complete amnesia and with nothing to spare. The only thing you do remember is that dark name. Not only that, but Barusem has a new #1 on their most wanted list. As you journey through the continent to fight against this force of evil, you will conquer dungeons, craft, join guilds, and much much more. Will you find yourself, or will evil find you first? Throughout Zenna, you will have the ability to raise your skill level in many professions such as mining, fishing, woodcutting and more. 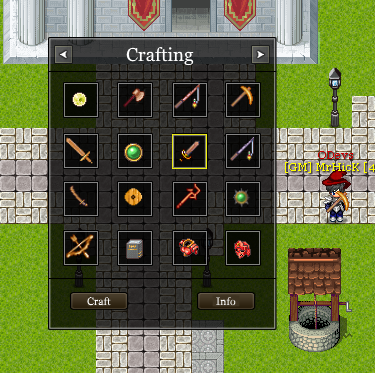 Each of these professions allow for the player to produce their own economy and/or collect resources for crafting. Some of them even give the player something fun and interactive to do just to carry some helpful items with them on their journey. In OutCast, our crafting menu is COMPLETELY custom and made from scratch. Not only that, but it also allows any player to open it just by pressing “F” on their keyboard and to use it anywhere on any map at any time. As long as you have the resources, there is simply no need to have to run all the back to a blacksmith. Every player when beginning will start as a “Refugee”, and will be allowed early in the game to choose a starting class. Later in the game after proving yourself and gaining some levels, you will be allowed the opportunity to advance your class to any of the possibilities based on your first choice. These advanced classes come with epic new possibilities for weapons, and enhance your stats. 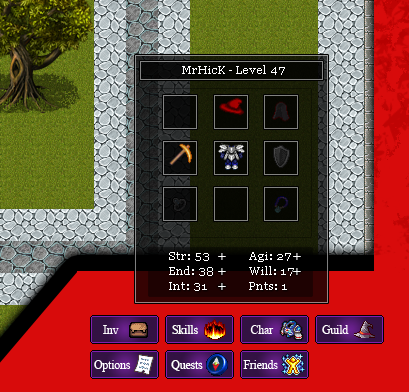 By clicking the “Char” button in your GUI or pressing “C”, you can access a total of 7 different types of equipment and 5 different types of stats for your character. After leveling up, you will receive 3 stat points you may allocate yourself to any chosen stat by clicking the “+” beside it. Each stat has a different effect, and each class benefits from specific types. This formula and the different types of equipment offer endless possibilities. Sometimes walking or running around is simply too slow and tedious. Well, in each town there is a pet shop (Pets will be sold here too soon) which sells up to 4 different types of mounts for a good price. Each mount gives an added effect of speed for the character, but combat is disabled while on a mount. Throughout your journey and your battle against Barusem, you will encounter many dungeons to run for epic items, high experience, and new storyline reveals. The coolest part is, if you don’t like dungeons, NONE of them are mandatory! 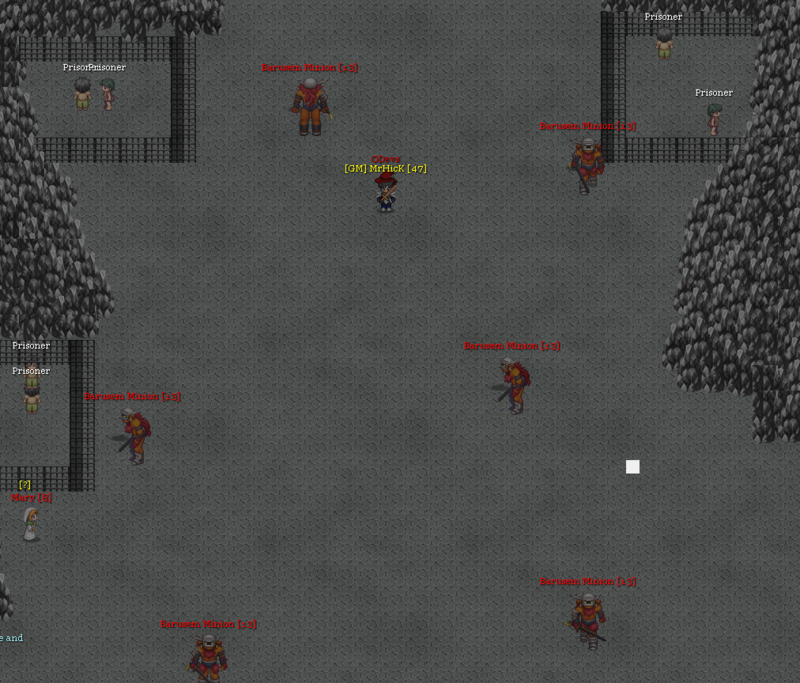 (We currently have 2 dungeons, but plan to add tons more). Along with our fully custom crafting menu, we also present players with a fully custom marketplace menu in game. 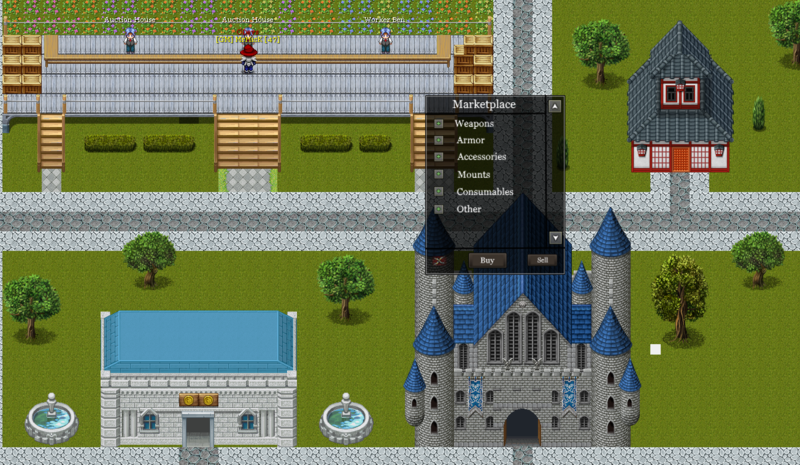 The marketplace promotes the game’s own economy between players, and allows for players to sell items, narrow down items by category, purchase items and more. All of the previous features are as easy as clicking the mouse, and the player must simply visit a marketplace hub to access the system. 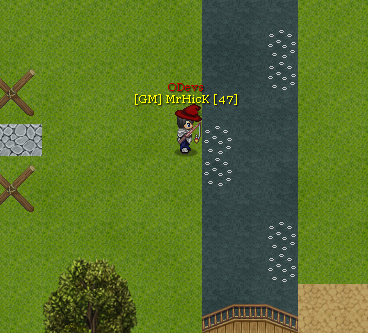 Outcast also includes other MMORPG-like features such as, but not limited to: full player interaction by right mouse click, interactive and highly exploration based quests, a spell system to allow players to cast different types of spells and teleports, unique music, a guild system, party functionality for multiple players, a buddies system, and much more. 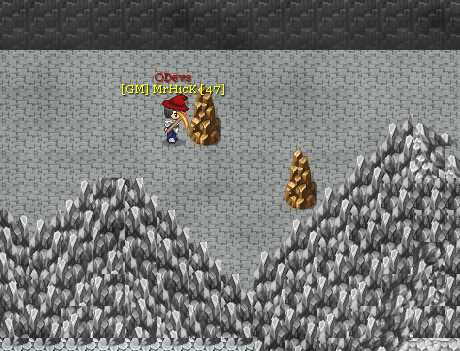 Our development team is responsible for the rest like custom GUI and extra/custom spritesheet development. All modifications to the engine’s base code is by me. In conclusion, we need players as pre-alpha and alpha testers to help us discover bugs and overall just have a good time with some good feedback. The game will stay free to play forever (unless the game makes a turn and new resources besides the default are created), and will only accept donations for server hosting later. If you enjoy Indie games and early access games, or maybe even just chill/relaxed games then OutCast is definitely a good choice for your next download. 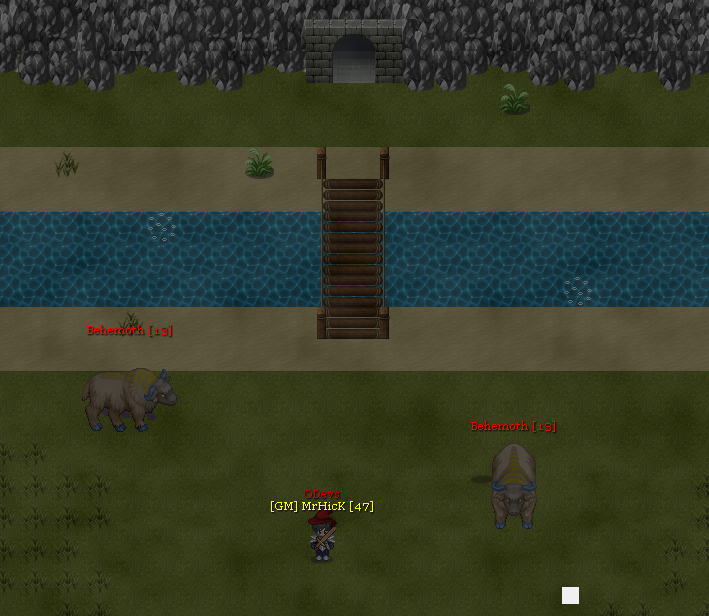 We pursue active, bi-weekly updates to the game and direct player interaction/support on any bugs or issues. Most of our logging and update information is posted directly on our forums. Installation is relatively simple, by downloading the launcher it also includes a README.txt which gives clear installation steps. The best part is, once you get the launcher and runtimes installed, starting and patching the game has never been simpler. These directions and FAQ for errors can also be found on our forums in the announcements section. Download Link: on the website just click “Download (LIVE)”. Happy Halloween! 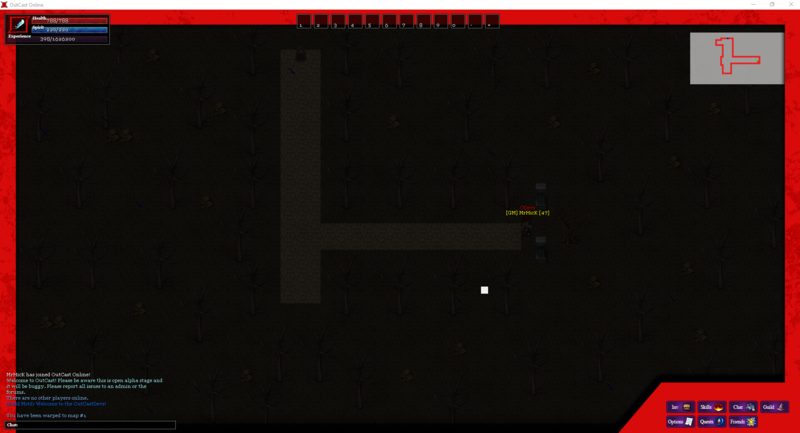 We hope to see some new players and testers in game! @solidlink Thank you! I definitely agree, we are going to focus on improving our maps during this testing phase for sure. Nice work so far! Look forward to seeing more. @randoyes Thank you! I might try to update this thread over time.